You are currently browsing the tag archive for the ‘cold’ tag. Hardiness Zone Ratings: Helpful or Not? Anyone who becomes interested in perennials quickly encounters the USDA hardiness zone map, which is ubiquitous in books, catalogs, and nurseries. The idea is that the minimum winter temperature in a given location can be used to select plants that will survive most winters. Of course, there are usually some caveats given about snow cover, microclimates, and so on. And not all nurseries list the same zone rating for each plant. I’ve seen a couple that seem to rate anything they don’t know about as zone 9! People apparently take this system very much to heart. It may be the only information a catalog gives to indicate the plant’s requirements – it’s obviously regarded as a terribly essential datum. Perhaps it’s our love affair with numbers, or the sense of security that comes from “knowing” which plants will survive and which ones won’t. Experienced gardeners, of course, know that you can lose some plants rated for a colder zone and successfully overwinter some rated for a warmer zone. I started wondering how useful these hardiness zone ratings really are. 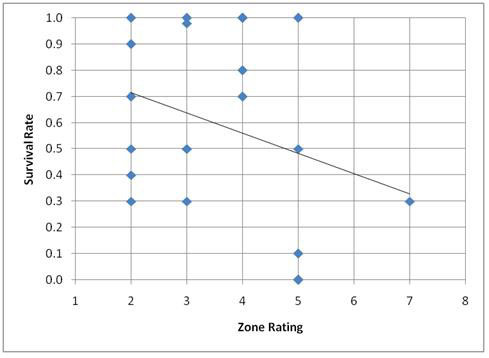 How well does the zone rating actually predict survival? Last year we had one of our coldest winters on record. The temperature dropped to -18 Fahrenheit at the beginning of February (with no snow cover), and the lows stayed below zero for a number of days afterwards. This is about the lower limit of hardiness zone 5. A simplistic interpretation of the hardiness zone ratings would imply that most plants rated for zone 5 or lower would survive, and that those rated for zone 6 or higher would perish. The best-fit line running through the graph demonstrates that there is in fact a trend in the expected direction: higher zone ratings correlate with reduced survival. But the scatter of the points themselves makes an even stronger point: for any given plant, the hardiness zone rate is a very unreliable predictor of survivability. There were zone 2 and 3 plants that fared no better than the zone 7 plant! In William Cullina’s excellent book Understanding Perennials, there is an explanation of the mechanisms that plants use to survive freezing temperatures. Truly tender plants (think of tomatoes or basil) simply cannot survive prolonged temperatures below freezing, because the water in their cells turns to ice and expands and destroys the cells. Some plants have chemicals in their cytoplasm that act like antifreeze and prevent freezing, even down to temperatures as low as 20 degrees. But to survive colder temperatures than that, the antifreeze strategy alone is inadequate. At lower temperatures, the cells will freeze, and the plant needs specially designed cells that can freeze without being destroyed (by shriveling to make room for the ice crystals, or by having particularly tough cell walls). 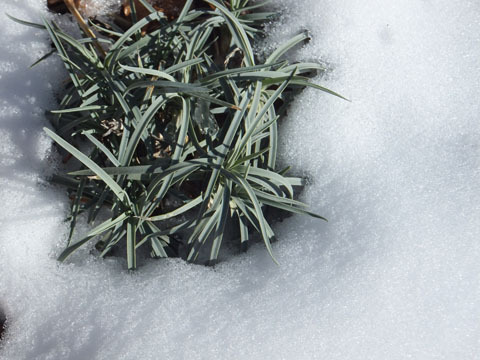 If a plant can survive losing its top growth, that is also helpful, because the soil temperatures do not swing as low as air temperatures, particularly under an insulating cover of snow. Cullina also describes how the timing of cold weather can effect hardiness. No plant is fully hardy when in active growth. Plants must prepare for cold weather in the fall and then return to growth in the spring. If the timing isn’t right, the plant can die from an autumn or spring cold snap, even if it could survive much lower temperatures in mid-winter. Mostly, we just have to live with the fact that we don’t know what will survive any given winter.